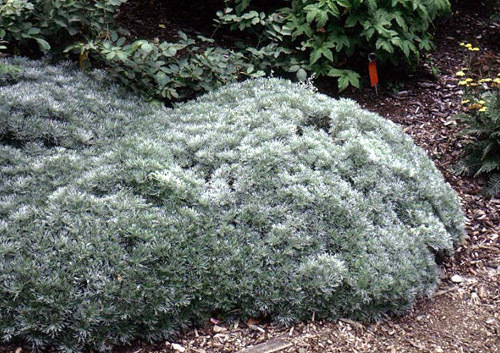 Striking and distinctive with finely cut silver leaves that form a dense mound of foliage. Very showy against green foliage of other garden plants. Needs very well-drained, low-fertility soil. Rots easily with excess moisture or humidity. May be only marginally hardy in Zone 4. Requires well drained soil. Careful pruning needed to keep it looking good through summer. Small blooms borne in clusters, typically removed to prevent deterioration of foliage quality. Bears short, erect flower spikes. Propagate by cuttings, division or separation - Divide in spring or fall. Avoid watering as moist soil and high humidity cause rot. Space plants for good air circulation. Remove blooms to prevent foliage deterioration. When plants open up in summer, cut back to new growth. This can be done gradually if drastic cutting detracts from garden aesthetics. 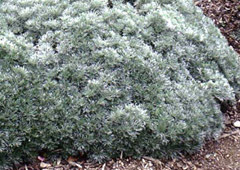 'Nana' grows just 3 inches tall forming a 1-foot-wide mound of fine silver leaves.